Cloud dough is very easy and cheap to make. It consists of only three ingredients, all of which are edible. The consistency of this dough is very nice and soft feeling and quickly turn to a damp feeling when being squeezed and molded. 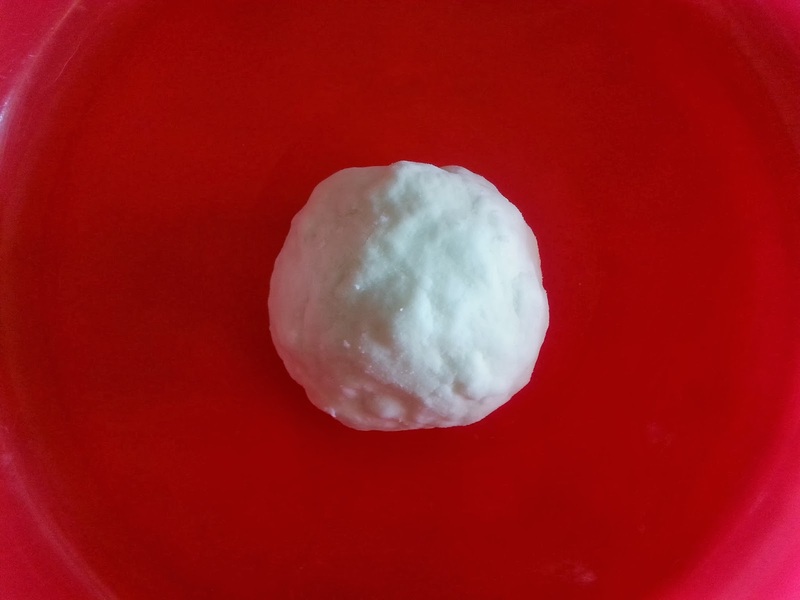 Cloud dough is a wonderful sensory activity for small children. Note: This will make a ball about the size of a tennis ball. To make more just double up on ingredients. 2. Make a well and pour in oil. 3. Stir using wooden spoon for about 3 or 4 minutes. 4. 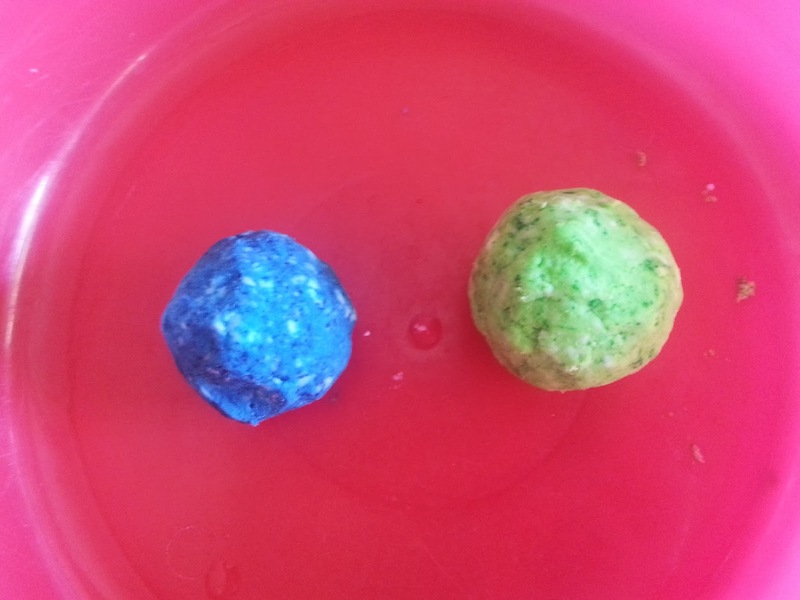 Add drops of food coloring and mix. Add more until desired color is reached. (This step is optional. You can leave the dough white if you wish). That was easy:) Thanks for shaing. WOW! I love how bright the colors are, what fun. My two year old loves play-doh, I am sure this will be a hit with her too. Thanks for the recipe! pretty nice...what a great idea! My daughter would love to do this. What a cool idea! And all with ingredients I have! I'll definitely have to add this to my list of things to do over winter break! I like the idea that its okay if my daughter decides to put it in her mouth. Will definitely be trying this out. With winter here we are always looking for fun indoor activities. What a fun activity! I love that everything is already in my cupboards! Me and kids did this when they were little, great memories. We just made this last week, or something similar. I prefer making our own so when it gets eaten it is okay. This is why I love this stuff. You don't have to worry if it does get put in the mouth. My almost 19 month old still puts almost anything in his mouth. Totally made something similar - GAK. The kids LOVED it! We usually use flour for our play dough and I don't care for the smell. I bet corn flour wouldn't smell as bad! I'm going to try it. Hi Corinne! I found there is a big difference in using the corn flour versus the regular flour. The texture has a much nicer feeling. There is no bad smell at all either. I will be using the corn flour from now on. My daughter hates getting her hands dirty! I think she would freak! This is such a good idea! I loved making stuff like this when I was younger! What a great sensory activity and great for working on fine motor skills and strengthening little hands. Love that it's so easy to make. Thanks! Took notes. My daughter and I plan on making some in a day or two for her Art while she is home schooling. I think this will be a really neat and fun project! Thank you for sharing!